Hello all and I hope everyone had a restful bank holiday weekend – those of you lucky enough to have one that is! 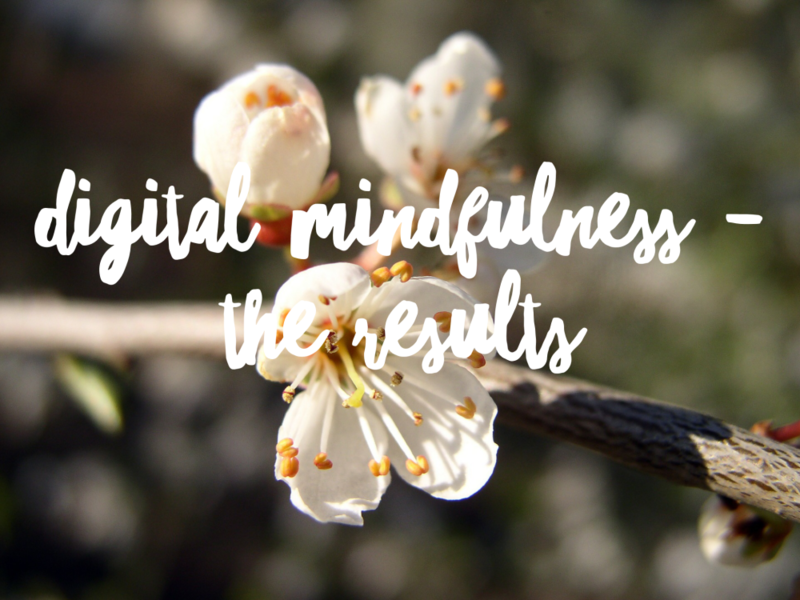 As I mentioned in my last article, I decided to have a little experiment in digital mindfulness and go offline for four days. I’ve been reading a lot around digital mindfulness recently. I firmly believe that many people, myself included, are sort of mindlessly marching our way to a life where we increasingly spend time and communicate with people online more than we do in real life. Where our reliance on the internet for a whole variety of reasons is getting more and more. Digital communication is everywhere as are opportunities to go online. I laughed outloud a week or so ago when researching meditation retreats and found a Buddhist centre which was pleased to announce that it’s new all vegan cafe had free wifi! Healthy living for the body but what about the mind? To cut a long thought process short – it’s too darn easy to go online these days, to chat to people, find stuff out, promote our businesses, indulge our hobbies and interests – but it is questionable how good this is for us and how much of the time we spend here is truly life enriching. So before bedtime on Thursday, I deleted the social media apps from my phone, turned all but one email account off and made a pact with myself that I wouldn’t go online until the following Tuesday. So how did my internet free weekend go? 1. To message my yoga teacher – I realised I didn’t have his phone number, I wasn’t sure I could make his class (or if it was on) and had no other way of checking or contacting him other than via Facebook – sad but true! and yes it was HARD to ignore the 18 notifications that I had by that point! But I did ignore them. 2. To look up the emergency vets number and address – rather crucial given the circumstances which involved Boots and some barbed wire (ouch! ), no apology required! 3. To post something on the village Facebook page – I am the admin, no one else could do it at that point and I didn’t want to let the organiser of the Easter event down by not honouring their request for a last minute plug for the event! Again, notification ignoring was hard, but was done. Anyway, that aside, I found the time offline really refreshing and thankfully easier than I had anticipated. Here are some of my key observations/ happenings. 1. I was not surprised, but I did notice how often my hand mindlessly went to grab my phone. I am so used to have a quick scroll of social media or emails whilst performing other tasks like boiling eggs, making tea, waiting in queues etc. that this was probably the most noticeable aspect of certainly the first 2 days. I didn’t put my phone away in a drawer as I still wanted to use it as a phone and a camera and I found myself laughing at how I was sort of carrying it around the house at times when I had no real use for it. 2. I did not take nearly as many photos as I normally do. I had my phone on me when I went out but without the outlet of Instagram or Facebook, I just didn’t feel I needed to take so many pictures. Or such perfect pictures either. Although when I realised I hadn’t taken lots of photos I temporarily felt a little sad, until I reminded myself that we hadn’t done or been anywhere out of the ordinary and I have dozens of pictures of the types of things we got up to at the weekend, walking, baking, enjoying nature, little moments of life and time. I didn’t’t really need to capture every day and every lovely moment we shared. 3. I read a lot of books – four in total. I usually read a book every week or so. When you go online for fun or for even some initially purposeful reason, it’s easy to get sidetracked and lose time chatting to people, leaving comments on social media, replying to emails etc. When you don’t do this, pockets of anywhere between 15-15 minutes appeared fairly regularly and in the evenings (I’m not a big TV watcher) without the distraction from my book every half an hour or so with the lure of the online world, I found that I just got stuck in and sat and read pretty solidly for big chunks of time. 4. Which leads me onto – I STILL have an good attention span! Yay! I was starting to worry that I had permanently damaged my ability to concentrate, or at least it would take some time and a lot of discipline to bring it back to its pre social media levels of laser like focus ;). However, it turns out you just have to put your phone down, forget about it for a while and do things that require concentration like reading et voila, your ability to concentrate for more than a nanosecond curiously returns and with speed. I can’t tell you how relieved this discovery made me! So if you worry about this too, please, just go offline for a couple of days, if only to reassure yourself that your superpowers are still there. We don’t lose our ability to concentrate but our opportunity to do so is curtailed when we hop on and off line all day. 5. And following on from that, I found my mental chatter subsided a lot. I have got this under more control in the last year or so thanks to regular meditation. However I have long suspected that the way in which our attention is so fragmented when we regularly go online and use social media creates a lot of mental chatter. Also, the more negative aspects of our thinking increase as our insecurities and anxieties are triggered by information we get online. Without this fragmentation and triggering of thoughts, it’s much easier to be more mindful, stay in the moment and also have some really really good ideas about things. 6. On Monday, I actually drove up to the local shops and discovered on arriving and wanting to confer with Dom about something, that I DIDN’T HAVE MY PHONE. Not sure the last time I ever left the home without my phone but it’s been a long time and basically I never forget my phone. Ever. My keys, my lip balm, my cash card? Yes. My phone? No. So what was my biggest learning? What I missed most wasn’t social media, which is what I assumed it would be. It was watching talks, listening to podcasts and reading articles from my favourite websites and favourite speakers and writers. I really missed the ability to listen to new ideas and understand new ways of seeing things. I missed finding out about my favourite subjects like simplicity, mindfulness, altruism. I binge watched Matthieu Ricard videos on Tuesday night as a reward! I honestly would give up Facebook for TED talks if there had to be a straight choice and I feel better for knowing this. I also realised that online wasn’t as important to me as I thought that it might be and that I coped surprisingly well. I that if you enforce it and make a decision, it seems easier. The greater challenge will be to find a middle way, where I get a good balance and don’t feel like I am wasting too much time. I want to use my online worlds in useful, productive and enriching ways – though I also recognise the social benefits of some mindless online time too, it’s important not to get carried away with it. I have only been back online for three days and I already feel sucked back in again but luckily I have a weekend with just Jake coming up so that will limit my opportunities as I will be solo parenting and also want to make the most of my time with him before the Easter break is over. I’m also going to reset my Freedom app to get back into a good routine with that. 1. Needing to keep up with everyone on social media is not as important as I thought. I didn’t miss any business opportunities either and nothing happened that I really missed out on in terms of my friends lives. So I can happily create some boundaries around when I log onto those platforms and save myself time and headspace. 2. I love all the access to knowledge – videos, articles and podcasts and I really missed them. I don’t relax by watching TV, I relax by watching TED talks and researching topics I am interested in. there is so much useful stuff online that it would be crazy to deny myself on some anti internet stance. If you feel a bit overwhelmed by information and relationships, opinions and ideas from your online life, I really would recommend switching off for a while. I think rather than just cutting down straight off, actually taking some time out completely gives you the opportunity to notice your own personal habits, what you miss, what you don’t miss. And then when you do go back online, you will have a better idea of your own pitfalls and what changes you need to make. I’d love to hear from you if you went offline this weekend or if you have done in the past and whether than effected your online behaviour afterwards?